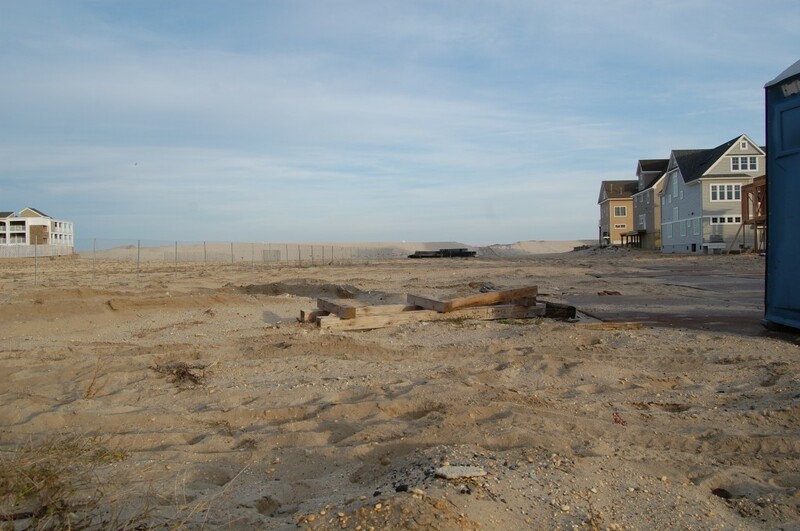 More than five years after it was destroyed by Superstorm Sandy, Brick’s Camp Osborn neighborhood is still just an empty lot with a nice view. The neighborhood south of the Ocean Club condominium complex consisted of two homeowners associations and one private plot on which residents leased their land, but owned their homes. That portion, the southernmost of the property, was the subject of a three hour-long zoning board hearing Wednesday night, yet none of the substantive plans for the plot of land were even discussed. The owners of 107 Lyndhurst Drive have, for a second time, retained a team of attorneys and professionals to fight an effort to rebuild a portion of the neighborhood. After the Board of Adjustment approved a plan to build 13 homes on the lot in 2016, the same neighbors sued the board, claiming the number of homes on the site was too much for its zoning, and the board overstepped its authority in issuing a variance. A superior court judge agreed, about the same time period when the plot’s owner, Bob Osborn, died. The lot was then sold to a North Jersey developer. This time, the number of proposed homes have been reduced to six, but an onslaught of procedural objections from the neighbors’ attorney, Robert C. Shea, kept the hearing from ever progressing to testimony. Shea focused on jurisdictional matters over the course of the three hour meeting, ultimately being accused of carrying out a “filibuster” by John Jackson, the attorney for RTS IV LLC, the owner of the Camp Osborn plot. “We feel that the notice you provided is defective on multiple levels,” said Shea, of Jackson. Shea, however, primarily focused his argument on the board itself, saying that because they published an annual list of meeting dates in just one newspaper instead of two – an obscure requirement of the Open Public Meetings Act that has to do with January reorganizational meetings – the board had no jurisdiction to hear the case. He also argued that because the Camp Osborn meeting was originally supposed to be heard Jan. 17, and notice of the reorganizational meeting was published Jan. 18, the meeting was voided. The township, however, sent notice of the meeting to the Asbury Park Press Jan. 12, though it took six days for it to appear in print. All of the arguments were rejected by John Miller, the board’s own attorney, who cited a decision from the state appellate division upholding Hopatcong’s land use board decision even though notice was sent to one newspaper instead of two, given that the municipality was in “substantial compliance” with the law. Shea then moved on to the issue over who received notices. Jackson received two different lists of addresses required to receive a notice of the meeting, and he chose to send notices to the homeowners on both lists. Shea questioned whether either list was complete, though township officials at the meeting said Jackson complied with the law – even going above and beyond his responsibility – by sending notices to all the addresses contained on each list. Shea then questioned whether the application should be heard because there are sewer hookups that extend onto other properties and a driveway that could, in the future, be shared once the remainder of Camp Osborn is rebuilt. Jackson, visibly frustrated by the long list of objections, accused Shea of intentionally holding up the proceedings to inflict monetary damages upon his client. “Their selfishness is trying to shut down everything, and it’s disgraceful, and we will seek a remedy to their actions,” Jackson continued. The meeting ended without any decisions, except to carry the proceedings to Feb. 28. Shea said he has additional objections to bring up at that meeting, which will begin at 7 p.m.